Yesterday, the EIA released its weekly report on fundamental oil statistics, the most notable of which was a larger-than-expected crude inventory draw that brought crude inventories down to 436.5 million barrels (MMbbls). Gasoline also got a large, four-cent boost from the 1.2 MMbbl build, which was roughly half the size of market expectations. Over the past quarter, the trend has been for inventories to follow seasonal trends. After a rocky start at the beginning of Q4, inventories remained relatively flat, unable to break out of the 450-460 MMbbls range. By mid-November, the decline had resumed with winter heating demands putting excess demand on crude stocks. Overall, stocks have fallen roughly 30 MMbbls, or an average of 3 MMbbls per week, with inventories currently at 436.5 MMbbls. Despite the notable draws, crude inventories are well above 2012-2015 average levels, before OPEC flooded the market with crude oil. During that time, the average crude oil level was approximately 365 MMbbls, though for December the average has been 370 MMbbls. 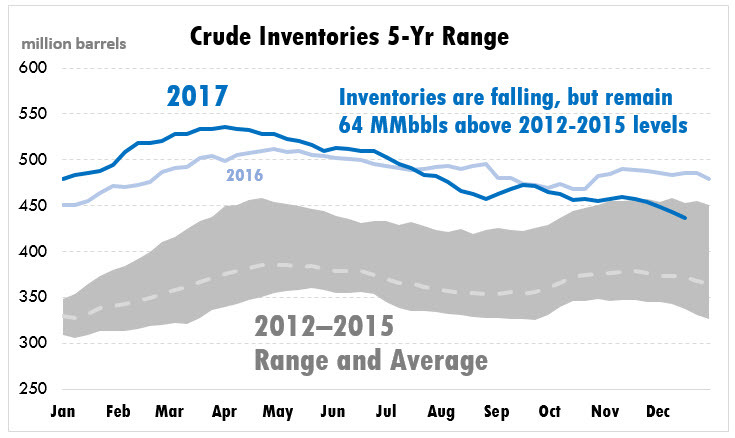 Even based on a higher December average, inventories remain more than 65 million barrels above historical averages. For the second-half of 2017, a time when inventories traditionally fall, crude draws have averaged roughly 2.9 MMbbls per week. If the same level continues for the remainder of the year and into 2018, inventories would need roughly 5 months to return to historical average. Of course, crude inventories have not risen in the first quarter of the year since 2003, and have only done so five times in the past 35 years. 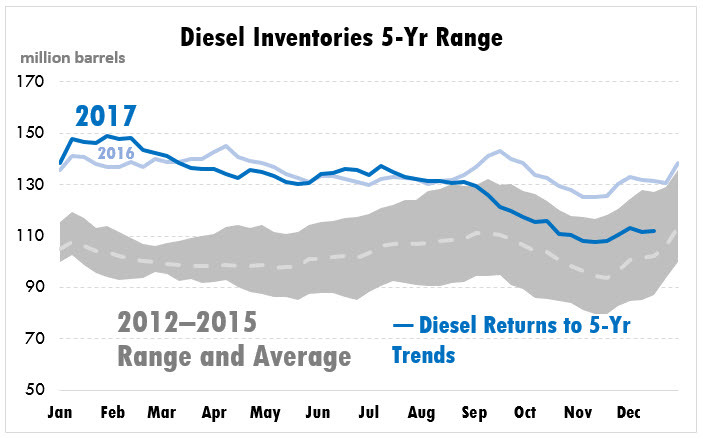 Diesel inventories are much closer to their historical average. At the beginning of 2017, inventories were 33 MMbbls above their 2012-2015 average; now, inventories are just 9 MMbbls higher. As of this week, diesel inventories are holding at 111.9 MMbbls , 20 MMbbls (15%) below levels at this time last year. One notable trend this year was the decline of diesel inventories during summer, which is highly unusual for diesel fuel. Diesel typically builds during the summer as school busses are off the road and many businesses are slowed by summer breaks. Over the past ten years, the average build during Q3 has been 9.5 MMbbls; this summer, inventories fell by 4.8 MMbbls. 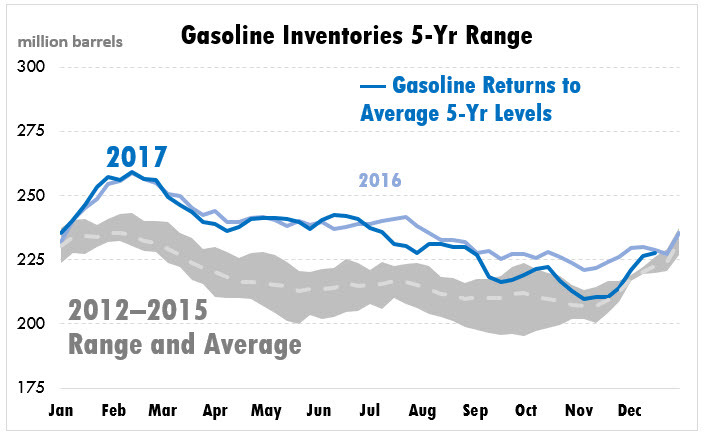 Last, gasoline inventories have fully returned to their historical range, coming as close as 1 MMbbls to their 2012-2015 average. Gasoline inventories have stuck fairly closely to seasonal trends, declining throughout the year before a large build-up during the winter. This year, inventories have fallen from a peak of 257 MMbbls down to a low of 209.5 MMbbls, a range of over 45 MMbbls. Markets expect gasoline to rise during this time of year, so recent builds have not had a strongly bearish pull on prices, though prices have seen some general weakness. The question this season will be how high inventories rise before beginning to fall. During the 2012-2015 timeframe, inventories tended to level off between 230-240 MMbbls; that changed in 2016 and 2017, when inventories surpassed 250 MMbbls. Whether inventories continue rising substantially in January and February will determine the overall price environment for gasoline in 2018.